WASHINGTON (AP) — A foreign policy adviser to Donald Trump’s presidential campaign met with a Russian intelligence operative in 2013 and provided him documents about the energy industry, according to court filings. Page briefly served as a foreign policy adviser to Trump’s campaign, though he split from the campaign before the election and the White House says the president has no relationship with him. He’s among the Trump associates under scrutiny as the FBI and congressional committees investigate Russian interference in the 2016 election and possible ties between the Trump campaign and Russia. 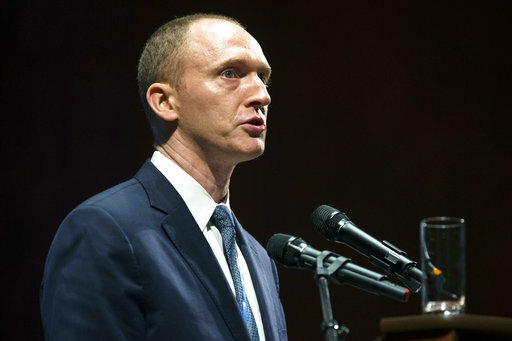 Page acknowledged in a statement Monday night that he “shared basic immaterial information and publicly available research documents” with Podobnyy. He described the information as “nothing more than a few samples from the far more detailed lectures” he delivered at New York University in 2013. BuzzFeed News first reported on the filings. Trump has vigorously denied that he or his associates were in contact with Russia during the election. He’s blasted the focus on his possible Russia ties as a “ruse” and has insisted that the real story is the leaking of information to the media and allegations that he and his associates were improperly surveilled by the Obama administration. “The real story turns out to be SURVEILLANCE and LEAKING! Find the leakers,” Trump wrote in a tweet Monday morning. Page’s contacts with Podobnyy happened about three years before Trump listed him as a foreign policy adviser to the campaign. Trump and his advisers have been vague about how Page became connected with the campaign. The meeting took place nine days before Trump’s inauguration and involved businessman Erik Prince, the Post reported. Prince, the founder of the security firm Blackwater and now the head of the Hong Kong-based company Frontier Services Group, has ties to Trump chief strategist Steve Bannon and is the brother of Education Secretary Betsy DeVos. Prince was a high-dollar campaign donor — he and his family reportedly gave more than $10 million to GOP candidates and super PACs in 2016 — and was a frequent critic of both President Barack Obama and Trump’s opponent, Democrat Hillary Clinton. In response to the Post story, White House press secretary Sean Spicer said “we are not aware of any meetings” and a Prince spokesman said the meeting “had nothing to do with President Trump.” Both said Prince had no role in the Trump transition.